This clever business card design has been specially printed so that at first appearance there's a QR code on the front which can used by clients who have a smart phone to scan it and instantly add the company's details into their address book. Alternatively the QR code panel can be scratched away to reveal contact information which is printed directly on the card. 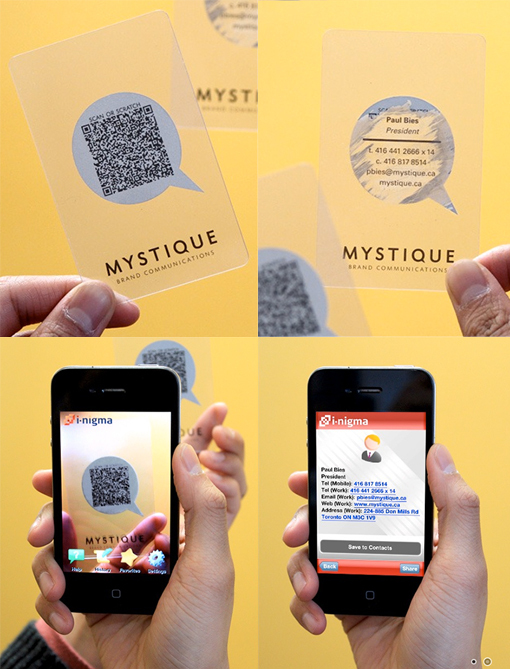 The concept makes clever use of the 'Mystique' brand (since something unknown is revealed from below the panel) as well as integrating phone based technology into the card, which is a nice feature for a communications company.